I could never imagine making a raita sandwich, until I ate one. Believe me it tasted so good and definitely healthier because there are no fatty things in the stuffing. This is my bhabhi's innovative idea of using the left over raitas. You may use any raita of your choice. Do give it a try, I'm sure you are going to like it too. Here I am making with corn raita. You can have many variations like boiled potato, green peas, cucumber etc etc. 1. Take 2 slices of brown / white bread. 2. Drain out the excess liquid from the raita and spread it on one slice. Place the other one on top. 3. Apply butter on the slices and toast it in a sandwich toaster or you can do it on the griddle also pressing the slices with a spatula on medium flame until crisp and golden brown. Preparation time ... 10 mins. Very innovative, loved the idea and the click is tempting. Very innovative !! so healthy and nice!! you can link this recipe to our "Quick and Easy recipe mela"
Wow, what a delicious sandwich filling idea:) Loved every bit of it:) superb..
Looks delicious,innovative n yummy..soo tempting.. I WILL give it a try! Looks delicious! Innovative and tasty .. thx for linking to the event. Great recipe,looks so delicious and healthy too. Thanks for the entry..nice one! Healthy and delicious. Thanks for linking it with let's cook speedy snacks. Great way to use leftover raita...and there always seems to be a bunch leftover! Very innovative and healthy sandwich with corn raita. 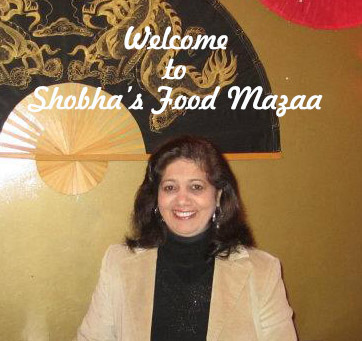 very unique & innovative Shobha! Also, thanks for sending it to my event. Very innovative and great way to use up left overs. 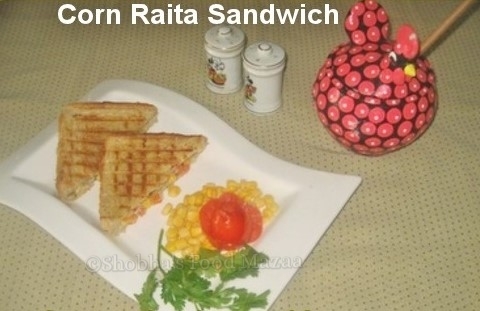 Corn raita sandwich sounds very interesting and innovative. The spices in the raita must make the sandwich moist and delicious.